ONE OF the more piquant details in the tale of Mitt Romney's damning "47 percent" video is that it was unearthed online by James Earl Carter IV, a grandson and namesake of the 39th president. The self-described "oppo researcher [and] political junkie" told NBC News that he tracked down the person who recorded Romney's remarks at a May fundraiser, then put him in touch with Mother Jones, the left-wing magazine that publicized the video last Monday. Carter's "research assistance" was credited in a terse endnote, but the reaction from his grandfather was more effusive: "James," the former president emailed, "This is extraordinary. Congratulations! Papa." The younger Carter wasn't coy about why he facilitated the leak. "I'm a partisan Democrat," he said. "My motivation is to help Democrats get elected." But it was also personal. According to NBC, he wanted to retaliate against Romney's "frequent attacks on the presidency of his grandfather" -- particularly the suggestion that Barack Obama's faltering foreign policy is Carteresque in its irresolution. "It gets under my skin -- mostly the weakness on the foreign policy stuff," the grandson said. "I just think it's ridiculous. I don't like criticism of my family." Well, who does? You can't fault the guy for wanting to defend his grandfather's reputation, but Jimmy Carter's reputation as a foreign-policy schlemiel can hardly be blamed on the Romney campaign. Americans came to that conclusion more than 30 years ago, having watched the world grow more dangerous -- and America's enemies more brazen -- during Carter's feckless years as steward of US national security. "There was strong evidence that voters … wanted a tougher American foreign policy," reported The New York Times on November 5, 1980, the morning after Ronald Reagan crushed Carter's reelection bid in a 44-state landslide. By a nearly 2-to-1 ratio, voters surveyed in exit polls "said they wanted this country to be more forceful in dealing with the Soviet Union, 'even if it increased the risk of war.'" In fact, Reagan's muscular, unapologetic approach to international relations -- "peace through strength" -- didn't increase the risk of war with the Soviets. It reduced it. Within a decade of his election, the Soviet empire -- as Reagan foretold -- would be relegated to the ash-heap of history. Like all presidents, Reagan got many things wrong. But one thing he got very right was that American weakness is provocative. A foreign-policy blueprint that emphasizes the need for American constraint, deference, and apology -- what Obama's advisers today call "leading from behind" -- is a recipe for more global disorder, not less. Carter came to office scolding Americans for their "inordinate fear of communism;" he launched diplomatic relations with Fidel Castro's dictatorship and welcomed the takeover of Nicaragua by a Marxist junta. Only when the Soviets invaded Afghanistan in 1979 did Carter wake up to the dangers of appeasing communist totalitarianism. Moscow's naked aggression, he confessed, had made a "dramatic change in my opinion of what the Soviets' ultimate goals are." Equally disastrous was Carter's reaction to the seizure of the US Embassy in Tehran following the Ayatollah Khomeini's Islamic revolution. Bernard Lewis, the dean of Middle East historians, writes that Carter's meek response -- from his letter appealing to Khomeini "as a believer to a man of God" to his abandonment of the overthrown Shah, a longtime US ally -- helped convince dictators and fanatics across the Middle East "that it was safer and more profitable to be an enemy rather than a friend of the United States." Is it fair to compare Obama's foreign policy to Carter's? 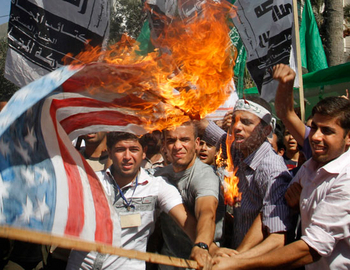 The similarities were especially vivid after the murder of four US diplomats at the American consulate in Benghazi. Even more so when the administration insisted that the outbreak of anti-American violence by rampaging Islamists in nearly 30 countries was due solely to a YouTube video mocking Islam -- a video the White House bent over backward to condemn. Anti-Western riots have erupted in more than 30 countries in recent days. But Obama-Carter likenesses were being remarked on long before this latest evidence of what the appearance of US weakness leads to. Obama was still a presidential hopeful when liberal historian Sean Wilentz observed in 2008 that he "resembles Jimmy Carter more than he does any other Democratic president in living memory." Within weeks of Obama's inauguration, troubling parallels could already be detected. In January 2010, Foreign Policy magazine's cover story, "The Carter Syndrome," wondered whether the 44th president's foreign policy was beginning to collapse "into the incoherence and reversals" that had characterized No. 39's. The Carter years are a warning of what can happen when the "Leader of the Free World" won't lead. 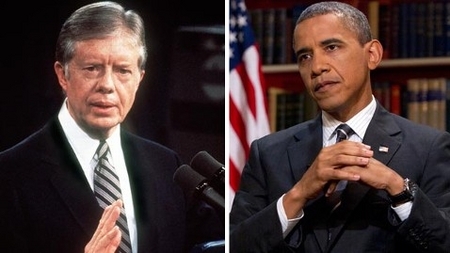 It may irk his grandson to hear it, but Jimmy Carter's legacy is still too timely to ignore.